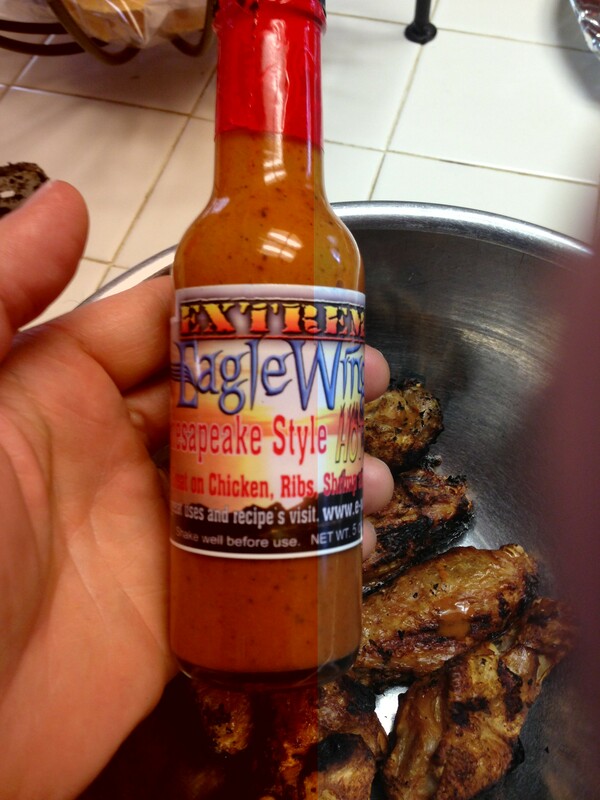 Chilehead Ken from FieryWorld.com recently tried our EagleWingz Chesapeake Brand Hot Sauce and gave his readers his honest review. Here is a brief excerpt from his review. Follow the link at the bottom to check out Ken’s full review of our sauce. This is a sauce that can’t decide if it’s a wing sauce or a hot sauce, or a BBQ sauce, or a………. and that’s the beauty of it! The simple, gluten free formula contains mostly basic ingredients: Cayenne Pepper, Distilled Vinegar, #1 grade Mustard Seed, Celery Seed, Salt, Black Pepper, Paprika, Turmeric, and Garlic Powder. And the Extreme version uses the same flavor profile, but layers in some Capsaicin to boost the heat. That’s it! The ingredient list is reminiscent of Old Bay Seasoning, very popular in that neck of the woods. But, it didn’t really have any hidden “spices” or other fancy stuff. Well, turmeric may be considered fancy cause it sounds cool and exotic, but it’s a subtle tone in this straight forward wing…errr…hotsauce. EagleWingz Extreme Makes a Great Wing! Speaking of Turmeric, the flavor of these sauces is excellent, especially if you are a fan of mustard-like sauces. The mustard seed base combined with cayenne is a favorite of mine, but then again, I’m a big fan of mustard based sauces in general. The celery seed adds a touch of sweetness, and the turmeric, a member of the ginger family from India, and a mainstay in mustard and Worchester sauce, adds a little pop and zing to the picnic of flavor! The Black Pepper plays more like a bottle rocket than a big starburst display, but in this fireworks display of flavor, you still know it’s there! Check out the Full Review from FieryWorld.com here.